Learning in preschool may not look like what you expect it to. What do you think of when you hear the word “school”? Books? Worksheets? Maybe a teacher standing in front of the class, solemnly instructing students in math, reading and writing. Well, this isn’t what you should see in pre-K.
Preschool learning is child-centered and based in play. That’s right, play is the primary way that preschoolers build new skills, explore new concepts and learn (even when it comes to reading and math). Read on to find out how play and learning go hand in hand in the preschool classroom. Young children have that awesome sense of curiosity that just comes naturally to them. They want to explore, investigate and experiment – and all on their own. Really. Give your child a box of natural materials, a palette of paints or an array of pint-sized instruments and watch what happens. Most likely they’ll start exploring how to use the objects and making their own discoveries well before you even tell them what to do. Using play as a learning tool in the pre-K classroom connects your child’s natural sense of curiosity with the content at hand. Whether it’s math, literacy, science, social studies or any other area, play-based activities allow your child to learn in a way that’s engaging and exciting. Think about what interests your child. Maybe it’s their growing doll collection, a favorite racing car, stuffed animals or a much-loved character from a movie. Your child talks about this “favorite” nonstop. Not only does your child talk about this favorite toy, activity or character constantly, but they kind of make their whole world revolve around it. Play-based learning lets your child take what is truly interesting to them and use it in an educational setting. Let’s say your child is all about blocks. They play with blocks morning, noon and night. But, it’s not just playing that’s happening here. Building block towers teach your child about science (physics) and math (measurement and form), and the learning doesn’t end there. Your child can keep right on learning about math by counting the blocks, making patterns and spotting different geometric shapes. And then there are the other content areas. Your child can create stories based on their block buildings, act out scenes with block castles or get artsy and draw block structure blueprints. Sitting at a desk writing out worksheet after worksheet is a solitary activity. Yes, the child may learn a new concept or get the chance to practice a skill. But, this type of activity quickly gets boring. Adding other children to the mix makes the activity at hand much more engaging, making it easier to learn. 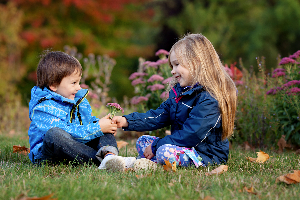 When play is used as a learning tool, children are often encouraged to work together. Not only is your child more into the idea of learning during play-based activities, but they’re also learning valuable social and emotional skills. These include sharing, taking turns, taking perspectives and cooperating with others. Even though these aren’t academic or educational tasks such as math or reading, these are equally important when it comes to your child’s overall development. To see learning through play at work, visit one of Kid’s Country Learning Center’s preschool programs.